The time has come again to get instrument current. 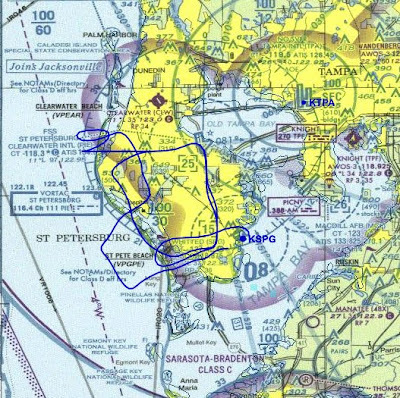 Last Friday (Aug. 14) our tropical weather let up just enough to do some approaches into KPIE, holding at LAFAL and navigational aid tracking. 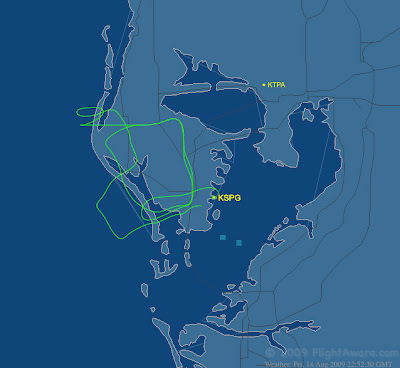 These days, courtesy of flightaware.com we can enjoy a pix of what the plane scribes in the sky while on an instrument flight plan. Aviating itself was luckily uneventful, except for one guy with a broken radio blaming miscommunication on traffic control. Had to be told twice every single time. Trying to be precise in the air once every 6 months is difficult on a good day, frustration is waiting to get in and still the show at every moment. The real surprise came after the plane got parked and tied down. We sat on a bench outside the FBO for a few minutes and talked flying. In the meantime, clouds started rolling in from the east, breeze picked up and the raid drops started taking over. It occurred to me that flying under the hood is quiet a bit a performance art. I wan performance by the number as in 0 deviation from heading and altitude. Zero deviation from glide slope and localizer. It's an art trying to come as close as possible to zero deviation when no two approaches are ever exactly the same. The beauty of it all resides in the moment, being in it at 90 knots an hour. And then it's all gone, except for a memory and a log book entry. There's no way save up the approaches, you can't pickle them in a jar. It reminds me of a Mandala. Grand and beautiful while in the moment. Hello from a fellow DR fan!